Pictured Above: The signing of the Oslo Accords on Sept. 13, 1993. Credit: Vince Musi/The White House. (JNS) A new poll of Palestinians shows that more than 60 percent agree that the Palestinian Authority should not engage in negotiations with Israel mediated by the United States, according to results published on Monday. Overseen by the Jerusalem Media and Communication Center, the poll, which was conducted among 1,200 Arabs from Judea, Samaria and Gaza from June 26 to July 7, revealed that 45.6 percent of Palestinians oppose renewing negotiations with Israel. If presidential elections were held on the day of the survey, more than a third said they would vote for current P.A. leader Mahmoud Abbas, while almost one out of every five people said they would vote for Hamas leader Ismail Haniyeh. If Abbas were not on the ballot, almost 12 said they would vote for Marwan Bargouti, a Fatah terror operative serving five life sentences in Israel for five murders of Israelis. Almost 12 percent said they would vote for Haniyeh. 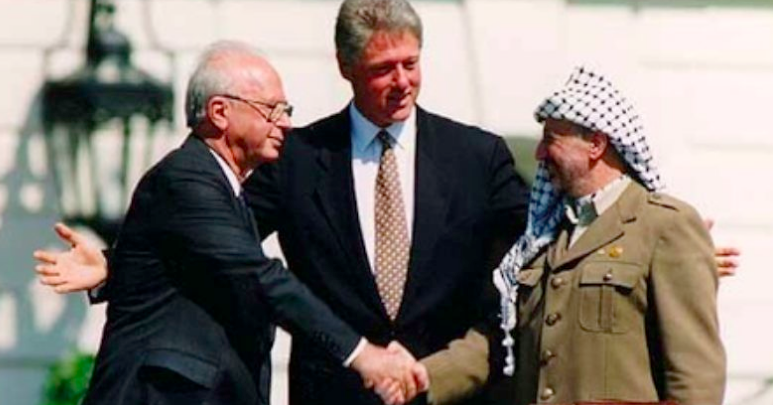 A significant number of Palestinians said they felt that the Oslo Accords, heralded as a peace solution by U.S. President Bill Clinton and signed by Israeli Prime Minister Yitzhak Rabin and Palestinian Liberation Organization head Yasser Arafat, had done more harm than good. While 48.3 percent opposed the deal in March 2013, more than 61 percent disapproved of Oslo in the latest poll, with just 24 percent in favor.